A type of anticancer drug, the farnesyltransferase inhibitors (FTIs), has been proposed, but their use has been mostly limited to animal models. A Phase II clinical trial using the FTI lonafarnib began in May 2007. In studies on the cells another anti-cancer drug, rapamycin, caused removal of progerin from the nuclear membrane through autophagy. It has been proved that pravastatin and zoledronate are effective drugs when it comes to the blocking of farnesyl group production. However, it is important to remember that no treatment is able to cure progeria. 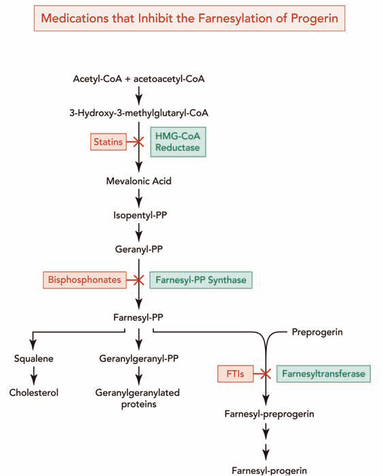 Farnesyltransferase inhibitors (FTIs) are drugs which inhibit the activity of an enzyme needed in order to make a link between progerin proteins and farnesyl groups. This link generates the permanent attachment of the progerin to the nuclear rim. In progeria, cellular damage can be appreciated because that attachment takes place and the nucleus is not in a normal state. Lonafarnib is an FTI, which means it can avoid this link, so progerin can not remain attached to the nucleus rim and it has now a more normal state. The delivery of Lonafarnib is not approved by the US Food and Drug Administration (FDA). Therefore, it can only be used in certain clinical trials. Until the treatment of FTIs is implemented in progeria children we will not know its effects—which are positive in mice. Pravastatin, traded as Pravachol or Selektine, is included in the family of statins. As well as zoledronate (also known as Zometa and Reclast, which is a bisphosphonate), its utility in Hutchinson-Gilford progeria syndrome (HGPS) is the prevention of farnesyl groups formation, which progerin needs to provoke the disease. Some animal trials have been realized using FTIs or a combination of pravastatin and zoledronate so as to observe whether they are capable of reversing abnormal nuclei. The results, obtained by blinded electron microscopic analysis and immunofluorescence microscopy, showed that nucleus abnormalities could be reversed in transgenic mice expressing progerin. 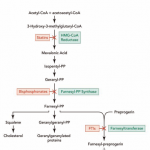 The reversion was also observed in vivo—cultured cells from human subjects with progeria—due to the action of the pharmacs, which block protein prenylation (transfer of a farnesyl polypeptide to C-terminal cysteine). The authors of that trial add, when it comes to the results, that: “They further suggest that skin biopsy may be useful to determine if protein farnesylation inhibitors are exerting effects in subjects with HGPS in clinical trials”. Unlike FTIs, pravastatin and zoledronate were approved by the U.S. FDA (in 2006 and 2001 respectively), although they are not sold as a treatment for progeria. Pravastatin is used to decrease cholesterol levels and zoledronate to prevent hypercalcaemia. Rapamycin, also known as Sirolimus, is a macrolide. There are recent studies concerning rapamycin which conclude that it can minimize the phenotypic effects of progeria fibroblasts. Other observed consequences of its use are: abolishment of nuclear blebbing, degradation of progerin in affected cells and reduction of insoluble progerin aggregates formation. All these results do not come from any clinical trial, although it is believed that the treatment might benefit HGPS kids. It should always be taken in account that no treatment is delivered in order to cure Hutchinson-Gilford progeria syndrome; all potential drugs are in pre-clinical stages. As there is no known cure, few people with progeria exceed 13 years of age. At least 90% of patients die from complications of atherosclerosis, such as heart attack or stroke. Mental development is not adversely affected; in fact, intelligence tends to be above average. With respect to the features of aging that progeria appears to manifest, the development of symptoms is comparable to aging at a rate eight to ten times faster than normal. With respect to features of aging that progeria does not exhibit, patients show no neurodegeneration or cancer predisposition. They also do not develop the so-called “wear and tear” conditions commonly associated with aging, such as cataracts (caused by UV exposure) and osteoarthritis (caused by mechanical wear). Although there may not be any successful treatments for progeria itself, there are treatments for the problems it causes, such as arthritic, respiratory, and cardiovascular problems. A study from the Netherlands has shown an incidence of 1 in 4 million births. Currently, there are 80 known cases in the world. Approximately 140 cases have been reported in medical history. Classical Hutchinson-Gilford Progeria Syndrome is usually caused by a sporadic mutation taking place during the early stages of embryo development. It is almost never passed on from affected parent to child, as affected children rarely live long enough to have children themselves (very few children with progeria even live past the teen years to be 21). There have been only two known cases in which it became evident that a healthy person can carry the LMNA mutation that causes progeria. These carriers were identified because they passed it on to their children. One family from India has five children with progeria, although this is not a classical HGPS ; they were the subject of a 2005 Bodyshock documentary entitled The 80 Year Old Children, while another from Belgium has two. In September 2011, the first reported case of a black African child with progeria was reported, 12-year-old South African Ontlametse Phalatse. The Progeria Research Foundation at Children’s Hospital Boston, affiliated with the Harvard University Medical School, is treating her and monitoring her case. This entry was posted in Oral medicine and tagged aging, farnesyltransferase inhibitors, Hutchinson–Gilford Progeria Syndrome, pravastatin, progeria, progeria fibroblast, protein prenylation, rapamycin, sirolimus, zoledronate on May 25, 2012 by chzechze.